Tenon Cutters - Log Furniture Tools | Schroeder Log Home Supply Inc.
Tenon Cutters It's a simple fact that tenon cutters make for beautiful log furniture! Tenon cutters are the log furniture tools that cut tenons on the end of your log rails and spindles. These handy implements work to trim the end of your log rails, allowing them to be inserted into other logs to create the base structure of your furniture project. If you're making or repairing a log home, you need a quality tenon cutter to ensure a strong, resilient fit on your log rails, one that won't come loose over the years of weathering and whatever nature might have to throw at you. 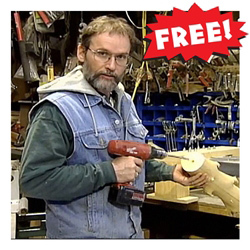 Schroeder Log Home Supply carries a wide variety of the best tenon cutters on the market. With us, you'll find tenon cutters from the leading names in wood cutting, like LumberJack Tools, E-Z Tenon Cutter and Northwest Tenon Cutters. Whether for use in a home, commercial or industrial project, these tenon cutters will get the job done. For the most demanding craftsmen and artisans, we also carry from their pro series. We also stock a wide variety of accessories for tenon cutter use. For example, our selection of tenon cutter countersinks can help you to cut the funnel-shaped impression into the log post after drilling with a self-feed bit, allowing it to accept the taper of the log rail. This provides a tighter fit on log furniture and gives a stronger shoulder fit on log rails. Browse our selection of tenon cutters and accessories today, and order now for convenient delivery to wherever you need them most. 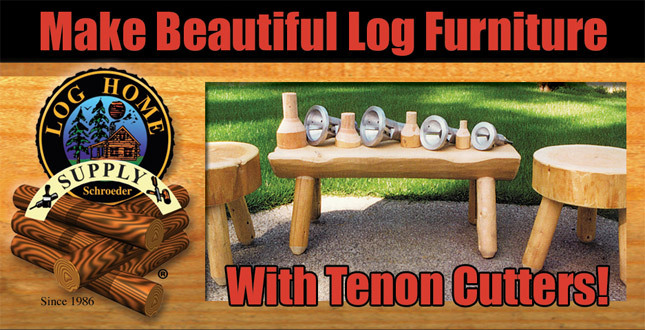 For more information or any questions on our tenon cutters, call Schroeder Log Home Supply today at 800-359-6614. As seen on The Outdoor Channel - "A Piece of the Woods" host Mike Heintzeman takes you through this 12 episode series with approximately 6 hours of instruction. Each episode is approximately 30 minutes. Now Available for Free!